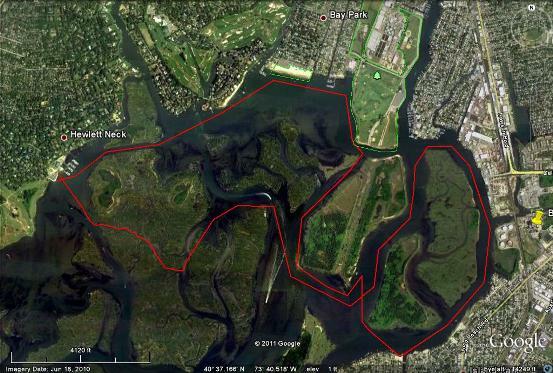 A couple of NACK paddlers recently had the opportunity for a trial preview of the soon to be announced Kayak Watertrail established by the Town of Hempstead. For those not familiar with the concept of a “watertrail”, it’s basically the waterway equivalent of a hiking trail. A course, or courses, is established along with trail markers to guide the paddlers on their way. There are maps, signs, designated launch points and information on sights to see along the way. Even the all important rest room locations are marked. Hempstead town’s south shore waterfront includes three large bay areas appropriately named West, Middle and East Bay. This first installment of the Watertrail is entirely within West Bay but we found plenty of wildlife and marsh to explore. Among the abundant wildlife we observed were about a dozen Osprey, magnificent birds of prey with a wingspan of almost six feet. We covered about nine miles on our trip but there are several shorter loops for those who don’t feel like paddling that far on a single trip. This Google Earth image is the approximate path we followed. It is NOT the same as the final watertrail. We did a little exploring and took at least one shortcut that is only passable at high tide. Don’t try to replicate this path, stick to the soon to be marked watertrail. The town has been working on this for a long time and has done a great job with the planning of the course. The maps we were provided included details like the locations bay houses, and even the locations of the many Osprey nesting sites the town established in West Bay. The Town Watertrail is part of a greater program to include all three bays and will one day provide a continuous watertrail along the entire south shore of Long Island. Our thanks go to Town Supervisor Kate Murray and Town Conservation and Waterways Commissioner Ron Masters for committing their time, personnel and funding to this important project. The Woodmere Dock is located at the intersection of Woodmere Blvd and Hickory Rd in Hewlett Neck. Good parking and a ramp to launch Non-Motorized Boats only. I’m sure the Town will post complete details shortly. I just have the proposed documentation. Thanks, and where is the Woodmere Town dock located? The park is at the southern end of Hewlett Point Avenue in Bay Park. What street is the Hewlett Point Park located on or near? On the preliminary launch site list Hewlett Point Park has a fee of $5 for residents and $6 for non-residents Memorial Day to Labor Day. But there is apparently no fee to launch (or park) at the Woodmere Town Dock. The start of the Town of Hemstead Kayak Water Trail (when it opens) will be a fantastic accomplishment. Long Island is truly an island with hundreds of miles of shoreline and the idea of a water trail around Long Island or along any part of Long Island (in the beginning) is truly an amazing proposition. I wonder if this is the first one? Will non-Hempstead residents be allowed to use the put-in(s) for a reasonable fee?